Versatile home cooks know that spinoffs are not just for sitcoms. Recipe spinoffs, aka tweaks, allow us to substitute on-hand ingredients while adding variety to our favorite dishes. 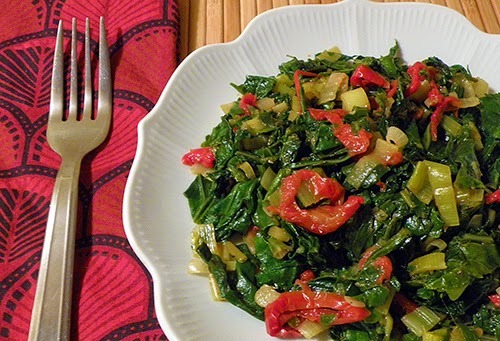 This kale recipe is a spinoff from Simply Braised Greens, a summer recipe of mizuna, bok choy, and spinach flavored with garlic, onion, red bell pepper, and thyme. 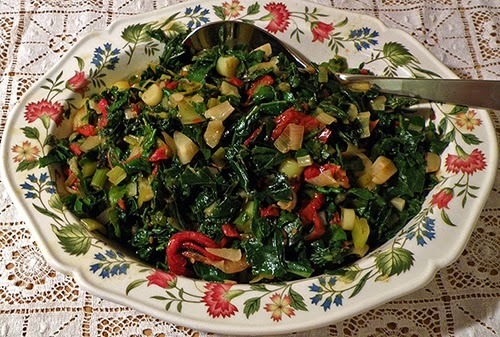 The spinoff employs springtime kale, green garlic, and leeks, dried tomatoes from last year’s garden, and oregano. These few ingredient switcheroos create a new dish: same method, but new and different flavor and texture. There are many varieties of kale, and depending on their tenderness their cooking times might differ. I used Red Russian kale, which is relatively hefty. Dino kale cooks quite a bit faster. 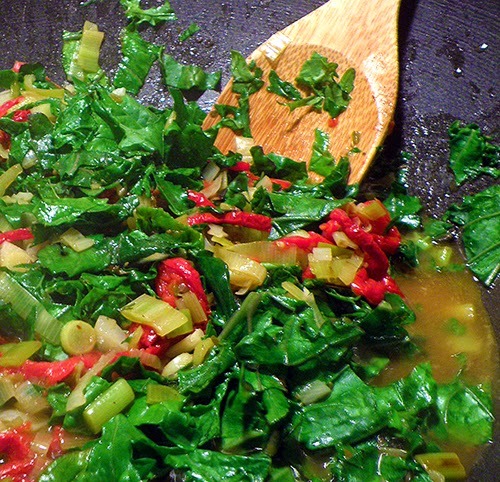 Once you add the kale to the braising liquid, observe it carefully as you periodically stir it, to avoid overcooking. Sample it when it looks close to done, and serve when it’s to your liking. Kale is a nutritional powerhouse, with antioxidant, anti-inflammatory, and cancer preventative properties. It’s easy to grow at home and readily available at farmers’ markets year round. Leave us a comment if you have other ways that you like to enjoy it. Heat olive oil in wok over medium high heat. Add sliced leeks. Stir-fry for about 2 minutes, leeks just start to get soft. Add chopped green garlic (or substitute 5 cloves of dry garlic). Stir-fry for another minute. 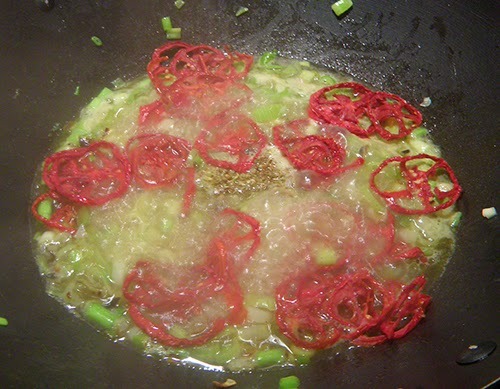 Add broth, dried tomatoes, oregano, and salt to wok. 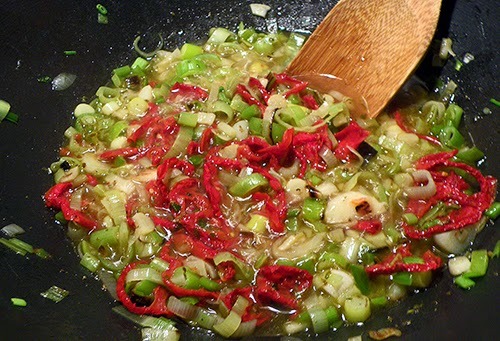 Bring to boil and lower heat to simmer for 4 – 5 minutes, until veggies are quite soft. Return heat to medium high, and add kale to wok about 4 cups at a time. Toss kale with broth until wilted, then add the next 4 cups of greens. Continue until all kale is incorporated. Stir down greens and scrape down sides of wok so that all veggies are close to or below the surface of the broth. Bring to boil, cover, and lower heat to medium to simmer. Simmer for about 6 minutes, stirring every minute or two to ensure even cooking and check for doneness. When done to your liking, remove kale and other veggies from liquid with slotted spoon. Place on serving platter and drain off excess liquid. You can recycle the liquid, if desired, as a tasty broth base in soups, sauces, or stews.